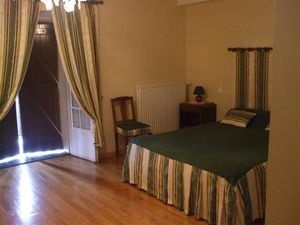 Splendid whizz rooms consisted of tranquilizes with balcony and my sur les Pyrenees. Chambers with health, comfortable and full of charms in the middle of Béarn, with possibilities of activities in white-waters in 10kms, and numerous walkings. Trade on place: pork butcher, patissier, baker, post office, garage, bar-brasserie. To Oloron Sainte Marie, follow Sarragosse, cross Arros, then, by entering Asasp, take to the right after the bakery. To take up quotation up to the place and to park, you arrived!